this is the final part to the long standing impermanent.audio series. 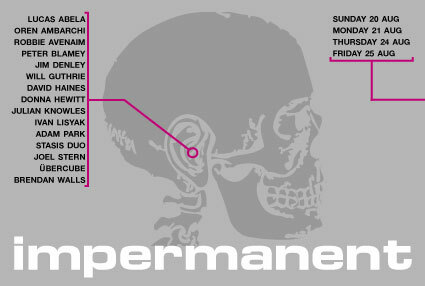 after hundreds of shows across many spaces, impermanent.audio will end with a best-of series of four events. the series is a thank you to those who have played, supported and just taken a look at these often demanding events. 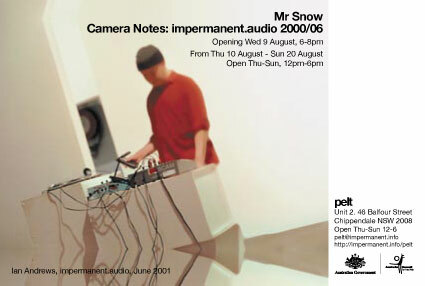 also running concurrently is Mr Snow's Camera Notes: impermanent.audio 2000/06, images from the impermanent.audio archive. come and have last drinks at PELT and listen. the Australia Council,its arts funding and advisory body.